Ham is called the coxofemoral part of the carcass (hind leg) and shoulder part (front leg). 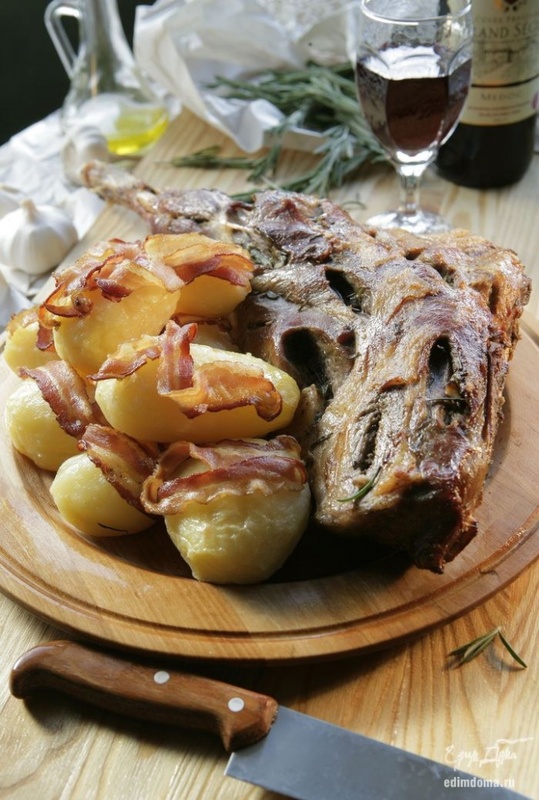 The mutton ham contains on average the same amount of protein as in pork, but fat is much less. Lamb meat and fat yield of beef and pork in the ease of absorption, but the taste is no less. Lamb can be easily and cook a variety of delicious and wholesome dishes. The most popular is grilled ham, he's good both hot and cold. Wash, dry with paper towels very carefully, chop into large chunks. Combine the soy sauce with balsamic vinegar, wash the lemon, squeeze the juice, add the vinegar and soy sauce, salt, pepper to taste, add cumin and spices. Put the meat in a deep glass dish, pour marinade. Use another method of marinating meat, putting it together with the marinade in a thick plastic bag. Tie it up carefully and store in the refrigerator for at least 6 hours. Preheat the oven to 180oC, place the lamb in a sleeve for baking, or wrap in foil. Make a few holes on top to release steam. Bake in the oven for 1 hour and 10 minutes, then unwrap and put back in the oven for 15-20 minutes. Serve meat with greens and garlic sauce (sour cream with garlic, salt and pepper). Preheat the oven to 180 ° C and proceed with the process of preparing the ham. Make on the surface of the ham small incisions-punctures, along the bone, make deep incisions. Grind into a homogeneous mass olive oil, fresh rosemary leaves, peeled garlic, salt and pepper with a mortar and pestle. Fill this mass of all the cuts on the meat, then cover the whole ham. Install on the lower level of the preheated oven empty the pan and on a medium grid. On the grill, put the ham and bake for one and a half hours. Peel the potatoes, cover with water, add salt and cook until soft, 10-15 minutes (bring to a boil potatoes at the same time laying the ham in the oven). Carefully remove the pan from the oven, put in it the potatoes, top lay slices of bacon. Return the pan of potatoes on the bottom level of the oven and continue to cook all together for another 40-45 minutes. Remove ham from oven, place on a large platter, the edges spread with baked potato and sprinkle with chopped herbs.